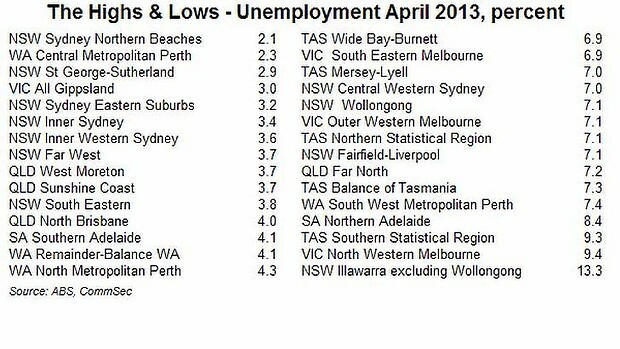 NSW has some of the lowest jobless rates in Australia, a new breakdown of unemployment data by regions shows. Six out of the top 10 regions in Australia with the lowest unemployment rate for April were from NSW, a CommSec analysis of detailed labour force data from the Bureau of Statistics, released on Thursday, showed. The unemployment rate was just 2.1 per cent in Sydney’s Northern Beaches – the lowest in Australia and a fall from 3.2 per cent in the same month last year. The unemployment rate … NSW regions have some of the lowest jobless rates in Australia. The St George-Sutherland region had a 2.9 per cent jobless rate, while the eastern suburbs recorded a 3.2 per cent unemployment rate. Following closely behind was Inner Sydney and Inner Western Sydney, with jobless rates of 3.4 and 3.6 per cent respectively. Far western NSW was ranked eighth with an unemployment rate of 3.7 per cent (for the month of March). At the same time, the state also reported the highest unemployment rate by region – 13.3 per cent – in the Illawarra excluding Wollongong (Wollongong recorded a jobless rate of 7.1 per cent). “Regions close to Sydney, Perth and Brisbane are doing best in the job stakes but job-seekers are facing tougher times in Tasmania, in outer areas of Melbourne and in northern Adelaide,” CommSec chief economist Craig James said in an economic note. Mr James added that NSW was fast becoming the lowest jobless state, snatching the mantle away from Western Australia, a reflection of a possible shift away from mining into other industries as the resources investment boom reaches its peak this year. The unemployment rate is a key factor in how the Reserve Bank determines the cash rate. Earlier this month, the central bank slashed interest rate down to 2.75 per cent, the lowest in half-a-century, following a spate of soft economic data and a weaker-than-expected unemployment rate for March. Australia’s jobless rate fell in April by 0.1 per cent to 5.5 per cent as the economy picked up more than 50,000 new jobs. This entry was posted on Friday, May 17th, 2013 at 11:45 am and is filed under EMPLOYMENT, JOB WORK OPPORTUNITIES, REPORTS STUDIES PAPERS. You can follow any responses to this entry through the RSS 2.0 feed. You can leave a response, or trackback from your own site. Created by miloIIIIVII | Log in | 82 queries. 32.099 seconds. | Entries RSS | Comments RSS.